Petals discarded with each breath. This entry was posted in mindfulness, nature photo, photos, poem, relaxation, spiritual and tagged Haiku, mindfulness, nature, photography, poetry, scotland, spiritual, spring. Bookmark the permalink. I hope you had a great holiday….I thought I hadn’t seen much of you in the blogsphere. I’ll look forward to reading about your holiday adventures 🙂 Glad you liked this spring fuelled post. that looks like a marvellous spot for a picnic. Gosh, it must feel as though winter is never going to end if spring still hasn’t arrived for you. I felt that this year it was a very long wait……it began to feel that it might not ever come….but it’s all forgotten as soon as the abundance of life starts pouring through. Oh, I love the bright faces of the dandelions… shame they always get such a bad name! Pleasant picture and words. But! Those little b….s like my lawn, and I’m forever uprooting them only to have two pop up for every one taken out! lovely – yes. And I have always loved dandelions. I have them in my garden too. Lovely photo, beautiful words. Thank you! They are indeed like little golden suns, in a sea of lime green. My Granny used to say that a weed was just a flower growing in the wrong place. Definitely Spring! Finally! Love that precious last line: petals discarded with each breath. Behind the manicured hedge is an old mill, which has been converted into a lovely home. 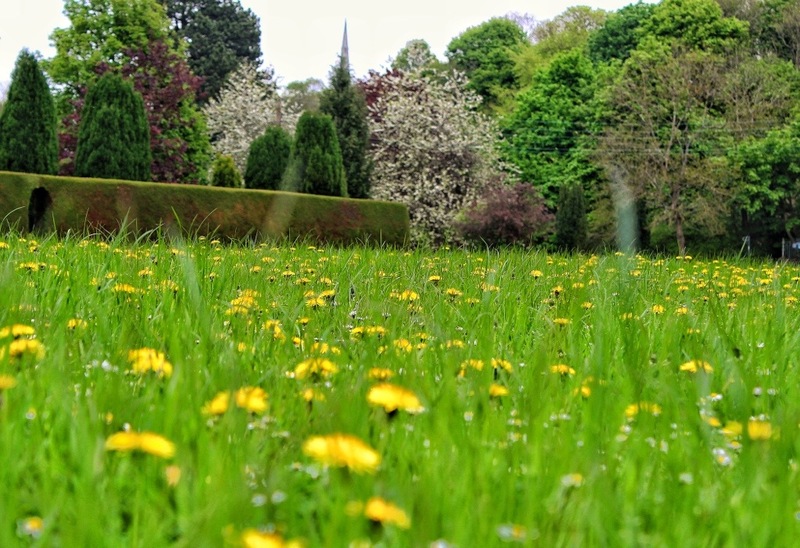 It sits in the middle of the dandelion park….hence the hedge for privacy! So glad you enjoyed the walk….